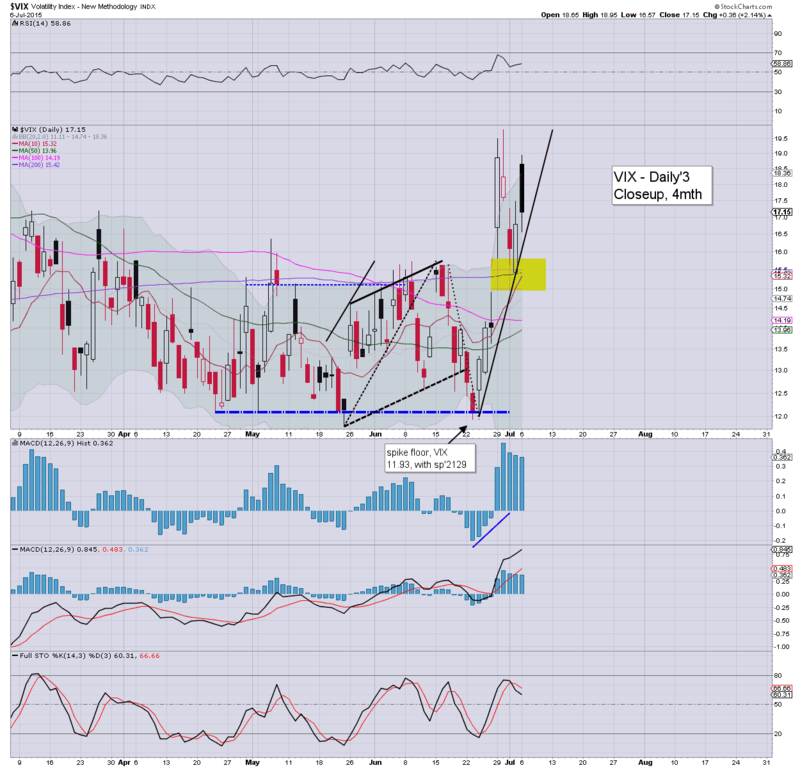 With equities resuming lower, the VIX was naturally on the rise, settling +2.1% @ 17.15 (intra high 18.95). Near term outlook is for further equity downside to the sp'2040/30s, which should equate to VIX breaking into the low 20s.. if briefly. *the closing daily black-fail candle would normally bode in favour to the equity bulls, but on this occasion, I will dismiss it. VIX 20s look due.. before the current up cycle is complete. Suffice to add, a minor net gain for the VIX, having cooled from the opening high of 18.95. 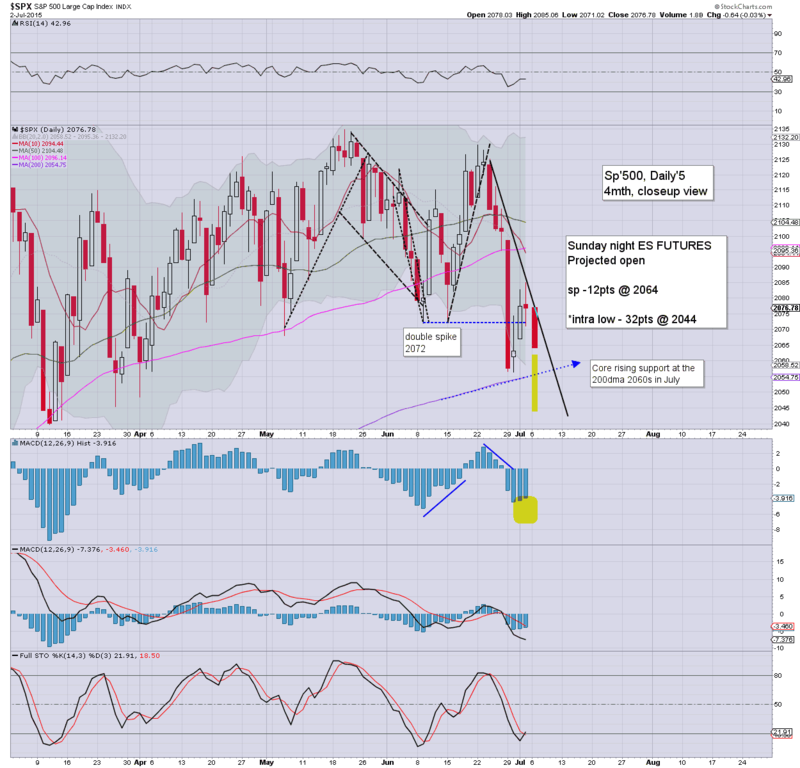 The low 20s look due in the current cycle, before equities can have a sustained bounce into August. US equities closed moderately weak, sp -8pts @ 2068 (intra low 2058). The two leaders - Trans/R2K, settled lower by -0.5% and -0.1% respectively. 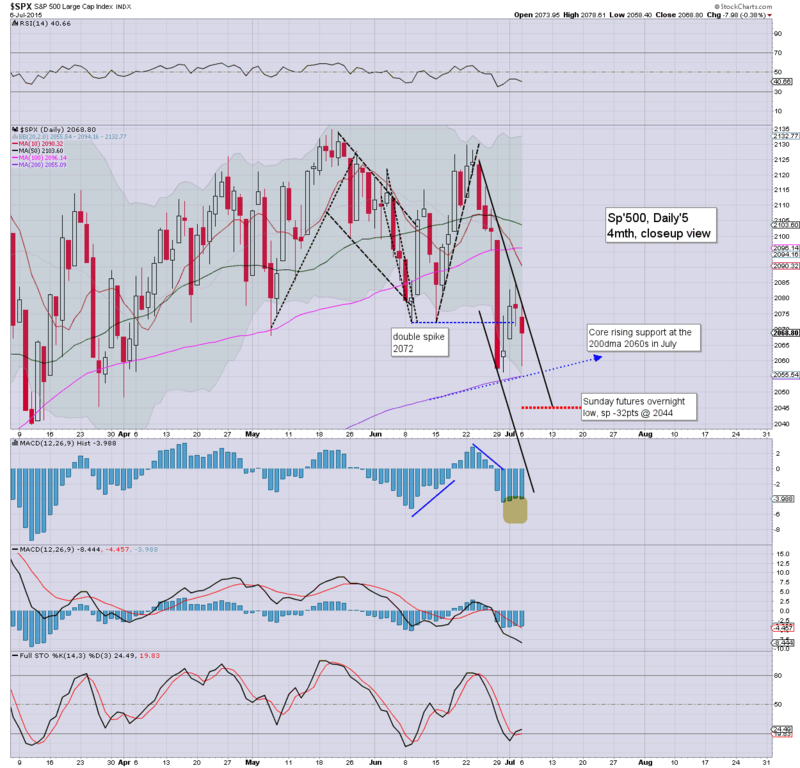 Near term outlook is for further downside to the 2040/30s.. with VIX 20/21s. A key cycle low looks due, with renewed upside into early August. *closing hour.. a lot of chop...with some degree of a short-stop cascade.. annoying those bears holding short overnight. Further weakness looks due tomorrow... with the Sunday night futures low - equiv' to 2044, highly probable. 4.12pm.. For no apparent reason, price action has jumped immediately after the close... sp +5pts... with VIX cooling to the low 17s. More sporadic Greek headlines... no doubt. US equities are moderately weak, and look set for further declines into the daily close. Regardless of whether the 200dma (sp'2055) is broken by the close, the 2040/30s look due tomorrow.. along with VIX in the 20s. USD +0.2% in the DXY 96.30s. Oil is in collapse mode, -6.9% in the $52s. *Best case for the equity bears in the immediate term remains the giant 2K threshold - as seen most clearly on the weekly cycle. 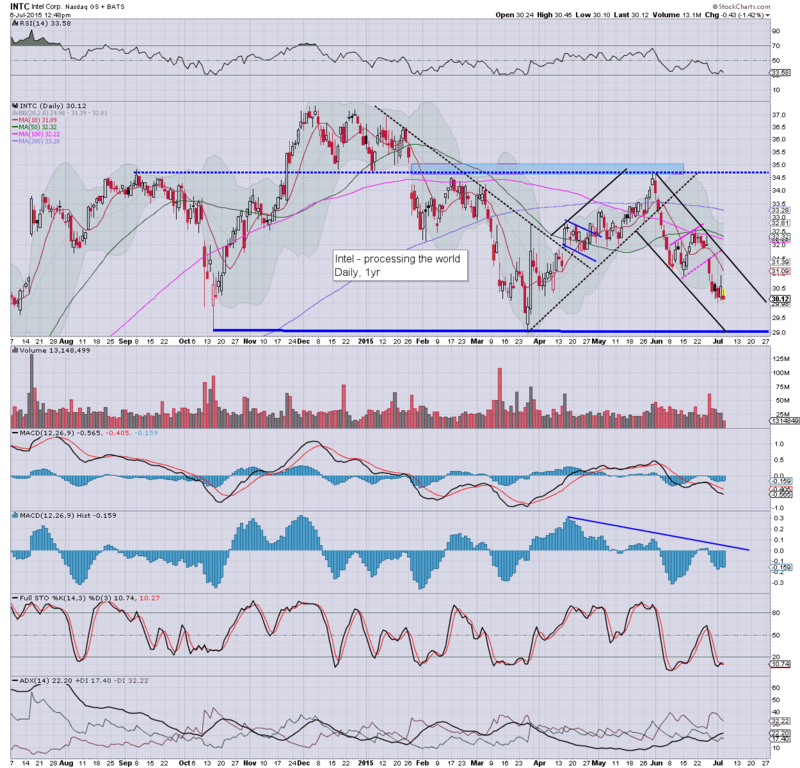 notable weakness: INTC -2.2% in the $29.80s.... fast approaching target of the low $29s. 3.12pm.. chop chop.. sp'2062.. VIX 17.90s..... another wave lower still looks due. 3.33pm... a minor short-stop cascade.. sp -10pts @ 2065. 3.44pm... time to roll lower again.... sp -11pts... VIX +5% in the 17.60s. With very few willing to buy at these prices levels.. or time, the market has naturally resumed the slide, with the morning low of sp'2058 set to be taken out by the close. VIX is reflecting increased concern, +8.3% in the 18s. WTIC Oil is in semi-crash mode, -5.8% in the $53s. 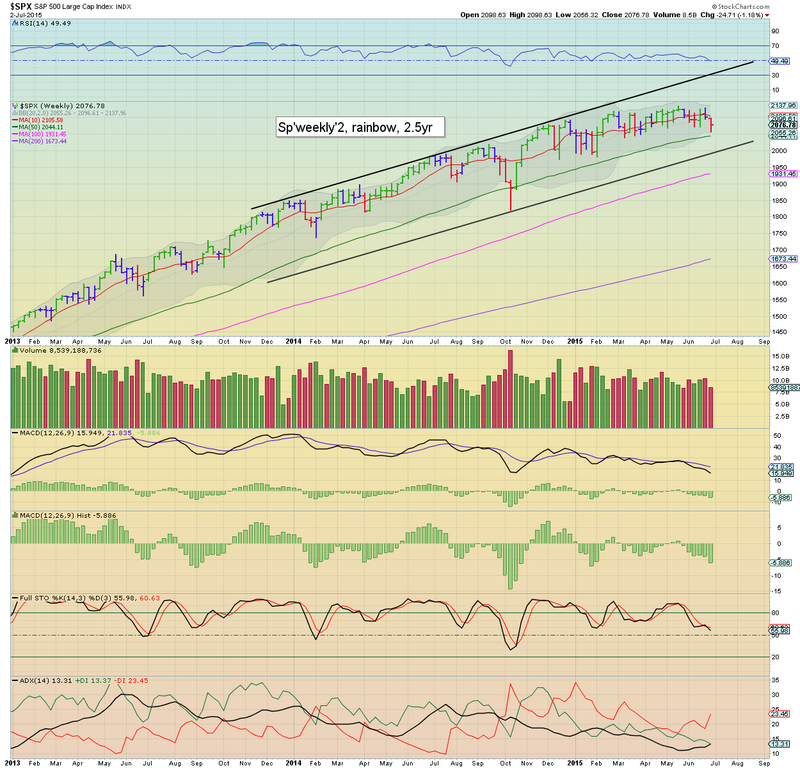 A net daily decline looks a given... the only issue is whether we close in the 2050s... or even 40s. Best case for the bears... a close under the 200dma... with VIX 19s... which would be a good setup for further downside tomorrow. After all.. there is no deal.. until there is a deal... right? 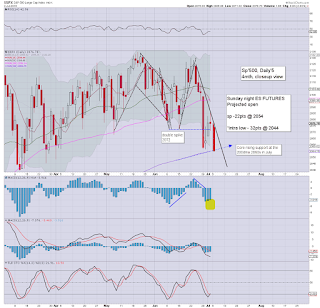 2.30pm.. sp' 2060...... already close to breaking the earlier low of 2058. VIX confirming an increasingly twitchy market..... the sp'2040/30s look due tomorrow. US equities remain moderately weak, sp -7pts @ 2069 (intra low 2058), and looks set for increasing weakness this afternoon.. as there remains huge uncertainty about the ongoing Greek debacle. VIX is reflecting some moderate market concern, +4.7% in the 17.60s. There is near zero reason why the market won't see increasing weakness for the rest of today. 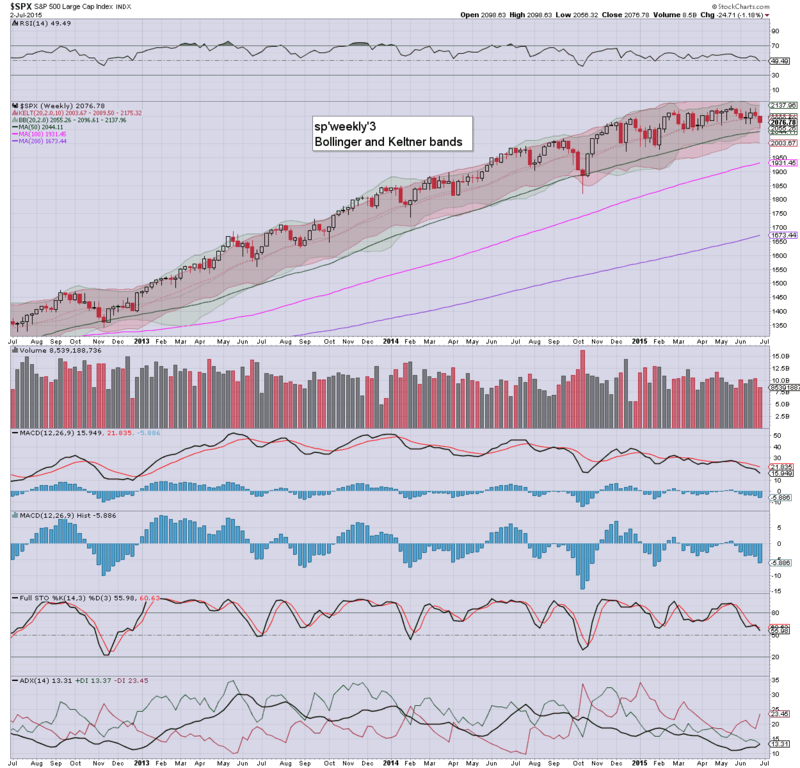 After all, who wants to be going long in the sp'2070/60s? A test of the overnight futures low - equivalent to sp'2044 (or so) looks highly probable. I am keeping an eye on INTC, as an indirect signal/proxy for the broader market. The low $29s look on track..which effectively completes a giant H/S formation. 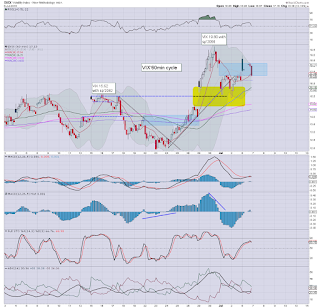 A rally to the 32/33s in Aug/Sept looks viable before sub $29. US equities are seeing some renewed weakness (if moderate). A test of the Sunday night ES futures low (equiv' to sp -32pts @ 2044) looks due tomorrow. A daily close under the 200dma (2055) remains a valid target by today's close. Oil remains exceptionally weak, -4.3% in the $54s. 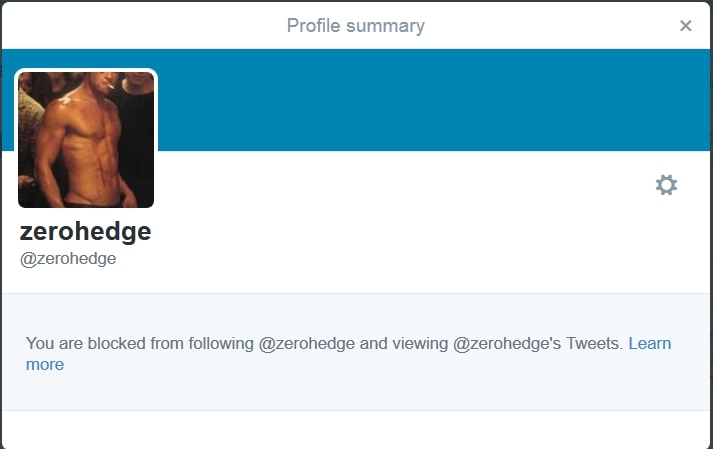 So... we're a little lower, but clearly some of the bears will have been rattled by the morning bounce. What I find even more unlikely though.. the notion of buyers in the near term.. until Tsipras can hack out some kind of deal. The daily black-fail candle on the VIX is not great, but then.. a long afternoon ahead... a daily close in the 19s would give clarity for tomorrow. Tsakalotos... yeah, another easy to remember Greek name. US equities are back to flat, having seen a sig' bounce of 0.9% to 2076, from the opening low of 2058. USD is cooling from earlier highs, +0.1% in the DXY 96.10s. Metals are naturally clawing a touch higher, Gold +$1. Oil remains sig' weak though, -3.7% in the $54s. It is typical turn time of 11am... renewed weakness into the afternoon - much like last Monday... looks due. The resignation (or firing) is a major mistake.. and makes the Syriza party/leadership once again look weak. I realise the creditors were outraged at how Varoufakis defied them... but that was exactly what was needed... and now that he is gone... I'd imagine some weak minded fool will replace him... who will do as the Germans (and other Troika partners) demand. 11.30am.. renewed weakness... right on schedule.. sp -6pts.. 2070. Increasing weakness across the afternoon looks due..... just like last Monday. After all... who wants to go long here.. ahead of more Troika meetings? *stockcharts is back online, woo hoo ! 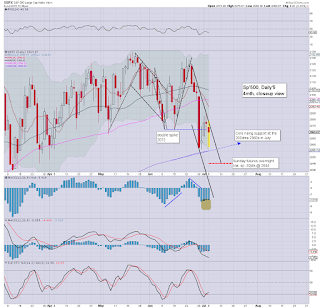 US equities open moderately lower, but notably.. still holding above the 200dma of sp'2055 or so. USD is holding moderate gains, +0.3% in the DXY 96.40s. 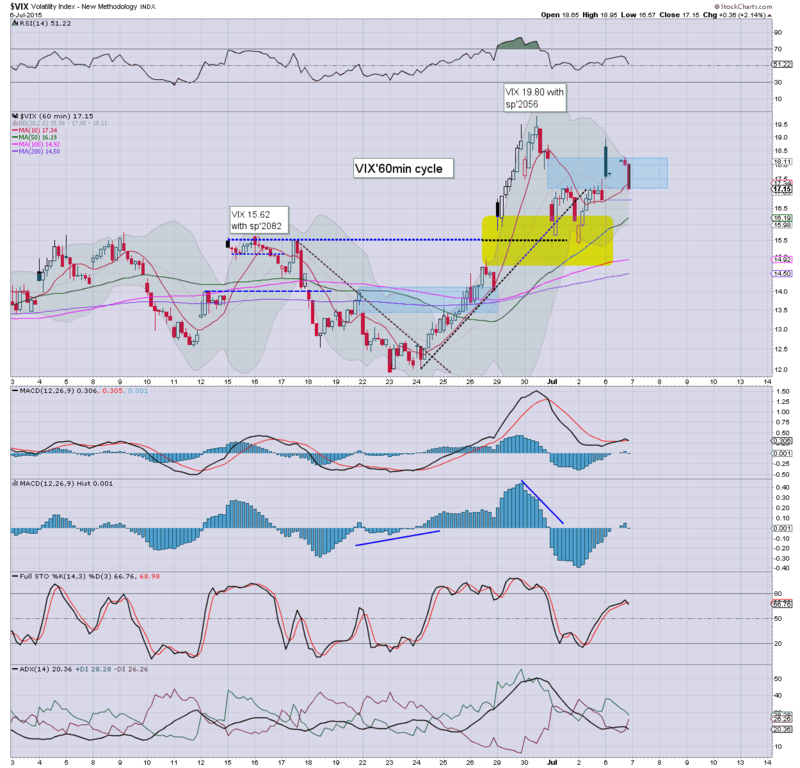 Metals are failing to capture any kind of flight to safety/fear bid, Gold u/c. Oil is exceptionally weak, -3.9% in the $54s. *stockcharts is FAILING to update... hopefully it will not be broken for the whole day. However I can still draw on my charts though! A relatively subdued open.. considering the news. Are the China govt' trying to buy the US market too? More than anything right now.. VIX has rapidly cooled from the open. No doubt.. the opening candle is now a giant black-fail.. with an opening spike high of 18.95.... now 17.50. We saw a sig' 20pt upward swing last Monday though... and that day didn't end so well for the bull maniacs (sp -43pts). notable weakness: CHK -2.9%, BTU -7.5%... energy sector naturally having serious issues. ISM service sector: 56.0 , market was seeking 56.0.. again.. and something for the bulls.. esp' in terms of GDP projections. 10.06am.. 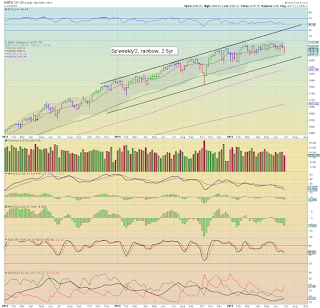 So err... who wants to go long at sp'2066? Thats right, I didn't think so. 10.24am.... sp -7pts... 2069... almost a full gap fill.... latter day weakness.. BELOW the morning low looks due. 10.31am Stockcharts.com remains broken.. and its starting to annoy me. Typical turn time remains 11am..... and I would imagine we'll roll lower from there.... much like last Monday. 10.46am.. Hell... indexes flat/turning positive. I expect a bounce - like last Monday, but even this is starting to surprise me. VIX confirming... -0.7% in the 16.60s, a full 2pts from the opening high. Good morning. Futures are moderately lower, sp -12pts, we're set to open at 2064.. having recovered from an overnight low of sp -32pts (2044). 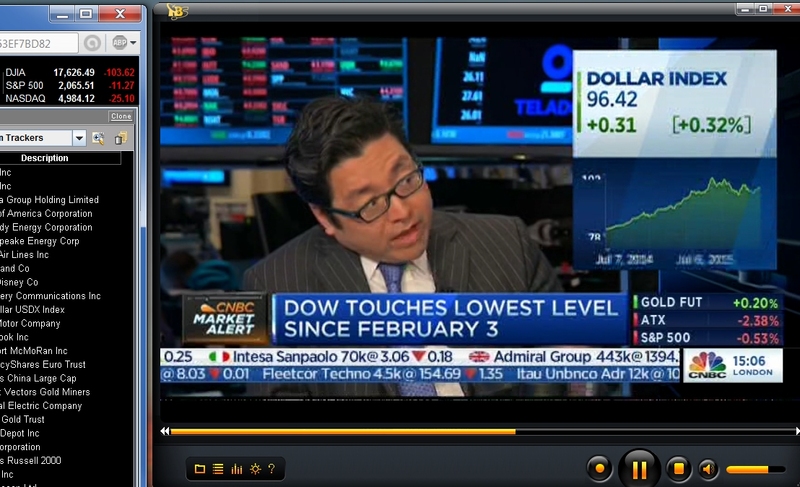 USD is +0.3% in the DXY 96.30s. Metals are u/c, whilst WTIC Oil is in collapse mode, -4.3% in the $53s. *there are an awful lot of headlines/comments flying across the news wires already this morning.. its going to be tough to keep up! First.. Greek finance minister Varoufakis has resigned. I suppose he at least managed to not have one of his arms cut off.. or worse. 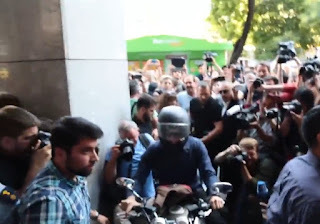 Impossible to know if he was pushed, but regardless, his leaving is a sign of great weakness within the Syriza party. Every day is a bank run in Greece, and many are now starting to realise the clock is ticking on a full GREXIT. 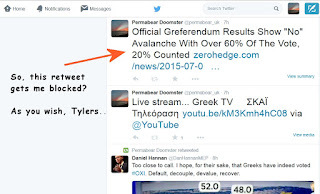 Unless more money is thrown at the Greek govt'... the banking system will be zeroed out. To me, a GREXIT is seemingly a given.... and if Greece goes.... others will follow.... with the EU fracturing into a million pieces. So... a significant overnight recovery, although we're still set to open lower. All things considered, market should at least test the overnight futures low, equiv' to sp'2044 or so. 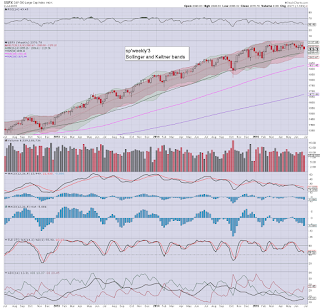 I do NOT expect sustained price action <2K in the near term. We'll likely floor somewhere in the 2040/00 zone, before the first opportunity of upside into August. Overnight China action: not surprisingly, with the China leadership 'politely requesting' the big financial institutions to start hitting the BUY button, the Shanghai comp' initially soared higher by around 8% to 3975. However, the selling resumed... with the SSEC settling +2.4% @ 3775. 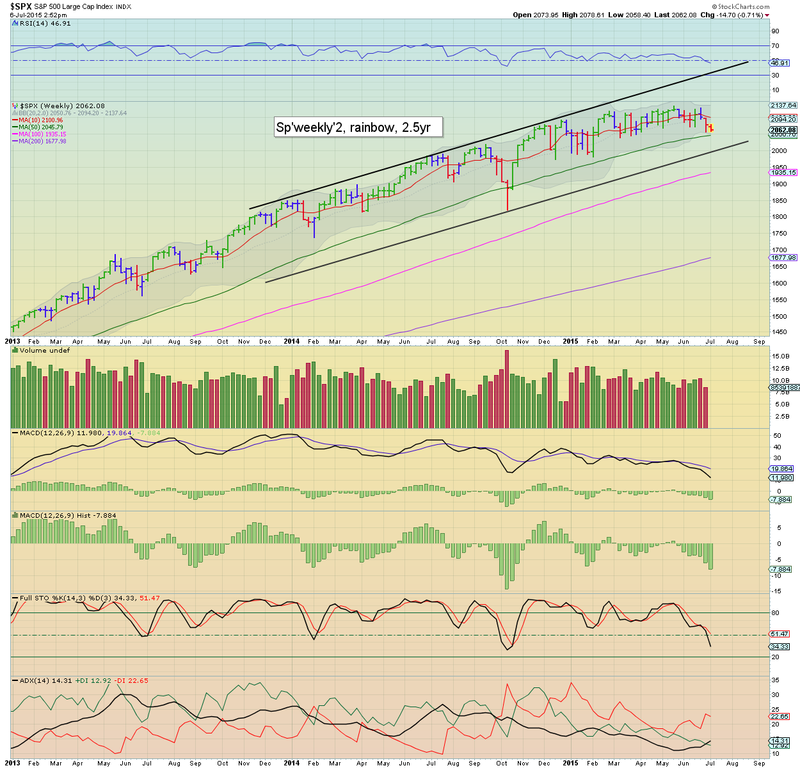 It certainly won't take much to resume the mid term downward trend... the 3500/3300 zone remains due. Even if China can bounce off that level, the bigger monthly cycle is now offering the 2500s in Sept/Oct. *awaiting ISM/PMI service sector data... that will be interesting, and again raise the issue of how weak Q2 GDP might be (due July 30th). 7.57am.. sp -17pts... 2059..... a little renewed selling... certainly the overnight low of 2044 looks highly probable today.... along with VIX in the low 20s. notable strength, bonds, TLT +1.5%.. although the broader trend remains very weak. 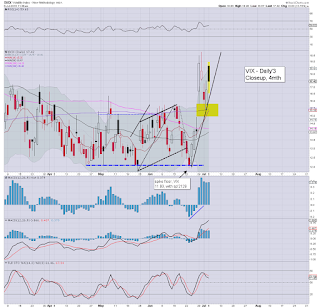 notable strength: VIX instruments... VXX +4.8%.. TVIX/UVXY +10%... both suggestive of VIX 20s at the open. FXI (China), -4.2%.. with 3x lev' YINN -12%... frankly.. I am increasingly confused at the price action in the China ETFS.... they are often not remotely reflecting the broader China indexes. It can't be currency issues... are they just badly structured? Remedial TA chatter... 200dma... but with zero mention of the bigger weekly/monthly cycles.. both of which bode for greater weakness into the late summer/early autumn. *Equity bears should be seeking a daily close <2055 or so... considering the huge uncertainty... seems likely. notable weakness, NBG (Nat' bank of Greece) -15% @ 96 cents.... just a matter of time before that one disappears. DB -4.7% @ $30.00s... German stocks understandably more impacted than US.. as they are the primary lenders. 8.57am.. sp -16pts... .2060.. for the open. Further weakness to the 2055/50 zone looks a given.. the only issue is whether the overnight low of 2044 will be tested today... or tomorrow. In scheme of things, it should make no difference to those currently short. 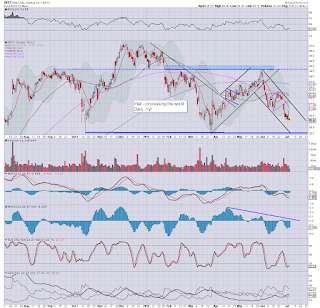 *I've eyes on INTC as an indirect indicator for when the market is going to floor... the low $29s will be key. 9.01am.. 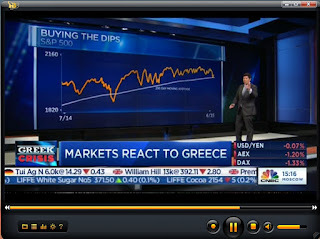 In more important news.. the Cramer is off.... heavily sedated as the Greek bank run continues? Gold bugs should be concerned... despite all the geo-political upset... Gold is actually a touch red. What happens when market confidence reignites? 9.39am.. VIX rapidly cooling from the opening high of 18.95. I'm surprised not to see the low 20s... but a long day ahead. Remember last Monday? Morning bounce.. with stronger weakness in the afternoon. US equity futures remain significantly lower, sp -22pts (intra low -32pts 2044), we're set to open at 2054. Metals are cooling from earlier highs, Gold +$3, whilst Oil is rebounding, now just -0.4%. Little to add. 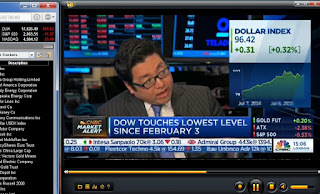 Not surprisingly, we're seeing the usual initial bounce, but regardless... the European and US markets look set to open lower. *Eyes on China (opens at 9.30pm EST... I think), the first major attempt by the Chinese leadership to 'inspire' the bigger financial institutions to hit the BUY button. I will assume its not a mistake, and that one of the infamous Tylers has an issue with something I've recently posted. Oh well, in some ways, I guess that helps separate me from them. 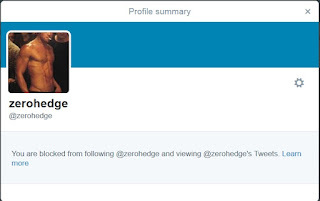 I have always endeavoured to be above the cheerleaders of clown finance TV... but neither the one track 'end of the world' mindset of Zerohedge. US equity futures remain broadly weak, sp -25pts, we're set to open at 2051... having decisively taken out the 200dma (2054).. last traded under Oct'20th 2014. Metals are holding moderate gains, Gold +$4, whilst Oil is -1.2% in the $54s. 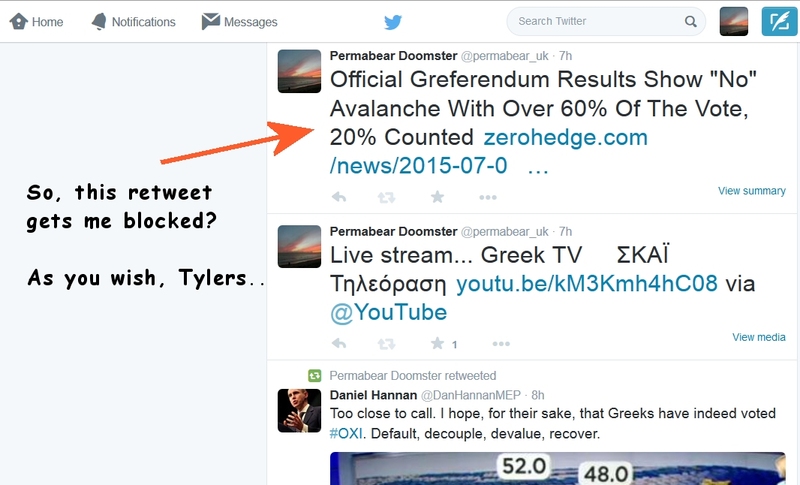 Clearly the Greek vote has unsettled many. Equity bears should merely be seeking any open under sp'2050 by 11am... that should offer at least another day or two of further weakness. Market will be increasingly anxious ahead of an emergency EU meeting on Tuesday.. so there is little reason to be concerned about sustained upside until after that. 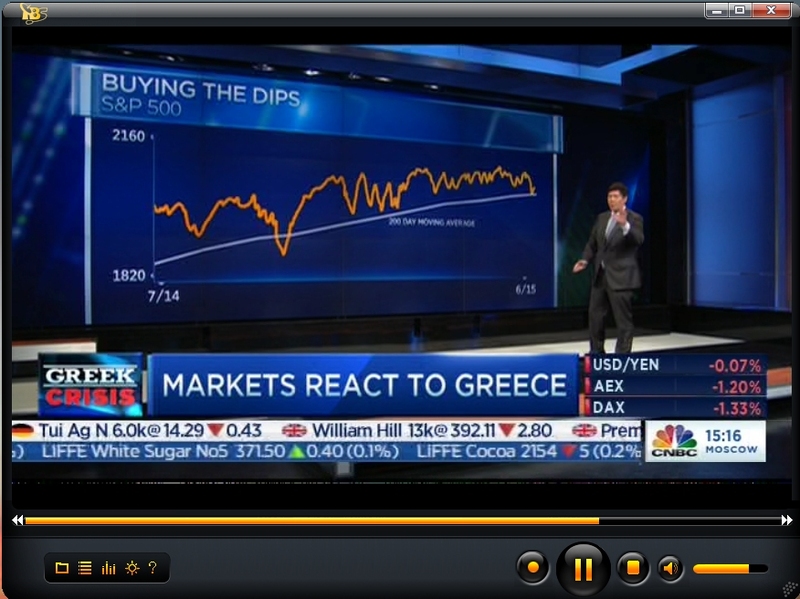 Personally, a GREXIT remains likely... given another few months. There is little reason why Greece will be able to remain in the Euro.. unless huge debt write offs can be agreed by the various creditors.. and that seems unlikely. The giant 2K threshold remains an obvious target. From a pure MACD (blue bar histogram) cycle perspective... we'll be getting a little on the low side this week... so bears will need to be careful.